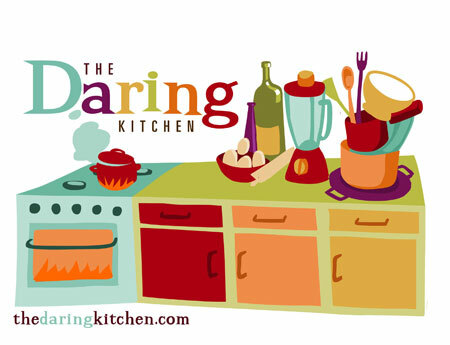 The January 2010 Daring Bakers’ challenge was hosted by Lauren of Celiac Teen. 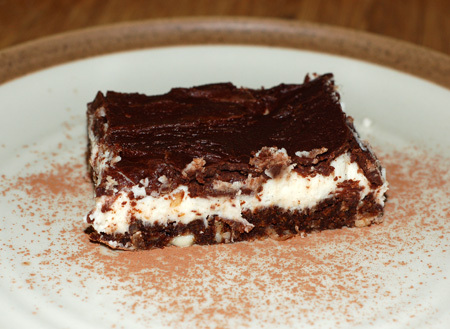 Lauren chose Gluten-Free Graham Wafers and Nanaimo Bars as the challenge for the month. The sources she based her recipe on are 101 Cookbooks and www.nanaimo.ca. I’d never actually eaten a nanaimo bar before, but I was familiar with them from the Willamette University Bistro’s offerings, so I was very curious to see what they were like. I make simple graham crackers all the time for my son, and have actually made the Nancy Silverton grahams before as well, so those weren’t new to me. 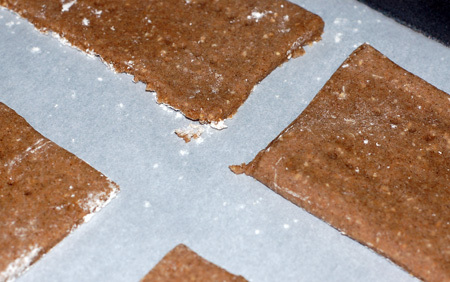 The graham cracker recipe used for this recipe is definitely sweeter than my basic one, but it also has more flavor (not that my son minds one way or the other). 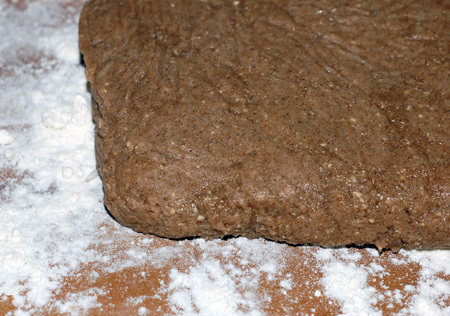 Since we don’t have dietary restrictions at our house, I just used some flour I already had on hand: 1 C AP flour, 1 C whole wheat flour, and as a nod to gluten-free baking flours, 1/2 C oat flour ground from rolled oats and 2 T buckwheat flour. I made the full batch of crackers so as to have extras for snacking. My dough came out quite sticky, but I’m told that was pretty common, and some flour on the board and rolling pin made it perfectly workable. My crackers took a few minutes longer than the suggested time to bake, but maybe that was because of my choice of flours. As you can see, my taste tester approves! They are especially good for teething 2-year molars. The crust for these cookies is a bit unusual, cooked briefly on the stovetop, then patted into the pan. 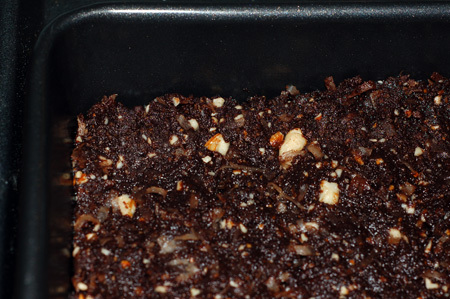 It stays soft and chewy, and the nuts and coconut give it some crunch. I used a 9″ pan instead of the 8″ called for, so my bars came out a little thinner than intended. I didn’t have access to custard powder, so I flavored the middle layer, essentially an American buttercream, with vanilla paste. I had some trouble getting my chocolate melted and cooled to a good consistency for spreading over the buttercream, so it wasn’t as smooth or shiny as I might have liked, but it served its purpose well. The finished bars were incredibly sweet, but we ate them all in about two days, so apparently we didn’t mind a bit. 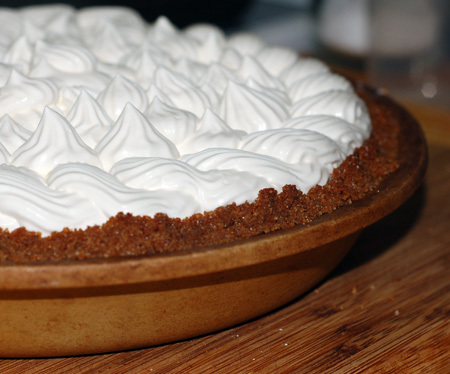 🙂 There were enough graham crackers not only for snacking, but for several pies with graham cracker crusts, so I also made a coconut cream pie (it did not cut neatly enough for photos!). For middle layer: Cream butter, cream, flavoring, and powdered sugar together well. Beat until light in colour. Spread over bottom layer, and chill. For top layer: Melt chocolate and unsalted butter over low heat. Cool. Once cool, pour over middle layer and allow to set. I will have to try to make these. 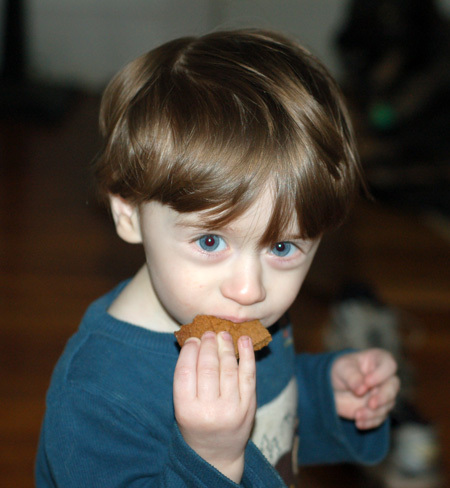 I just love graham crackers and I would love to try making them as soon as Calum can eat big people food. I get my Birds Custard at World Market…a complete comfort food from my childhood! On another note…are you up for another trip to Bobs Red Mill and Penzy’s in the near future? The Nancy Silverton ones are definitely richer and sweeter than the ones I typically make for Nolan to snack on… he likes them both, but the latter taste a little like cardboard to me. I would love to make another foodie trip with you. 🙂 Just let me know when you’re thinking of going!